White Rabbit are well known around town for hosting some pretty delightful (and really damn delectable) dinners and events. Their next spectacular heart and belly warming event at the Brewery and Barrel Hall will see White Rabbit and Provenance Wines entertain you with the Grand Cru Dinner. Due to the popular demand, White Rabbit had brewed their second annual Grand Cru. With the brewers spending the past 15 months pouring love and affecting into fermenting local shiraz grapes with the White Rabbit Sour Red to bring you the latest barrel aged single batch. To launch this glorious ale, White Rabbit is holding a four course dinner, with each course paired with a different White Rabbit beer as well as different Provenance Wines. 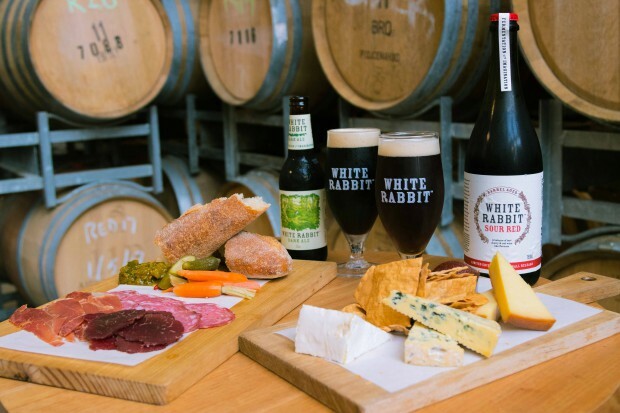 White Rabbit Head Brewer, Jeremy Halse, along with Provenance Wine Maker Scott Ireland, will passionately talk you through each pairing, as well as the delicate processes involved in making this genius combination. “A beer that’s been 15 months in the making, that’s what this event is all about.” Jeremy, White Rabbit’s Head Brewer explains. “It’s unique in the sense that we’ve used local shiraz grapes sourced and processed by Provenance Wines, which then come together with a batch of our Sour Red for an extended maturation in barrels – is it beer or is it wine? Guests can expect scrumptious offerings, with surprise pairings to be announced… perhaps even an exclusive vertical tasting of the Vintage 2016 and Vintage 2017 Grand Cru??? So what’s on the menu?? For entree, you can expect seared Tuna loin “Tataki” style on Fennel salad with wasabi aioli, fried ginger and chili along with a White Rabbit White Ale & Provenance 2017 Tarrington Pinot Gris. Now for the main, here’s a treat. Slow cooked Beef brisket, truffled mushrooms, parsnip cream, with Roasted Kipfler potatoes and winter vegetables with the White Rabbit 2016 Vintage Grand Cru & 2017 Vintage Grand Cru and Provenance 2017 Golden Plains Pinot Noir. Our favourite is of course the dessert. You’ll get a Chocolate Torte with White Rabbit Yuzu & Dark Ale and a Provenance 2005 Geelong Sparkling Shiraz. No stress if you’ve got some dietaries, as they can cater upon request (before the evening of course). If this sounds like something you want to get to don’t wait around, tickets will not last. The event will take place on Thursday 16 August 2018 from 6.00pm to 10pm at the White Rabbit Brewery and Barrel Hall in Geelong. Tickets cost $90 per person and are available via Eventbrite.